As most of you already know, we were blasted with an arctic storm this week. Schools and businesses all over our area were closed and state emergencies were declared. As a result, I had a snow day on Wednesday, and while it was lovely to have a day off midweek, I paid a hefty price the day before. The storm hit mid-morning on Tuesday. I drove the 19 miles from my house to my city office in the early morning with no problem. When I left work early around 11:30 that morning, however, I was greeted with a nightmare. A total traffic nightmare. Everyone else in the city had had the same idea. We were all trying to get out of the city at the same time. Those measily 19 miles….were stretched out over an agnozing three and a half hours. Yes. It took me almost four hours to get home on Tuesday. I live about a half hour from work in the outskirts of the Philly suburbs. It usually is not too painful for me to get to and from work. This time, though, my car almost ran out of gas (I started with over half a tank!) and my windshield wipers were completely coated in ice for most of my drive home. My car couldn’t get them warm fast enough. Not to mention the blizzard-like snow fall and thousands of other cars on the road. It was a disaster. When I arrived home, I immediately cracked open a bottle of wine (it was absolutely necessary), threw on my most comfortable (aka frumpiest) pajamas, and curled into the fetal position on the couch. I stayed there for 20 minutes or so, just mentally decompressing and sipping a generous glass of wine. When my husband arrived home (his usual half-hour commute was tripled), we were both in need of comfort food (and more wine). 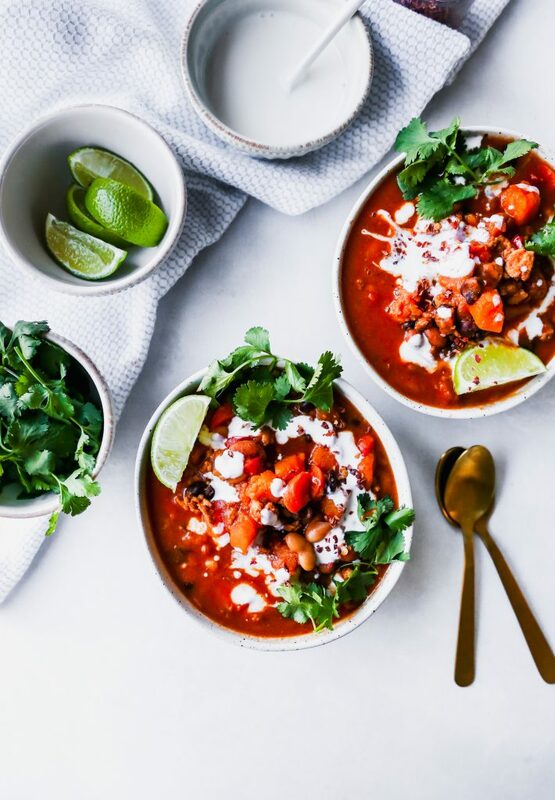 This chili fit the bill. 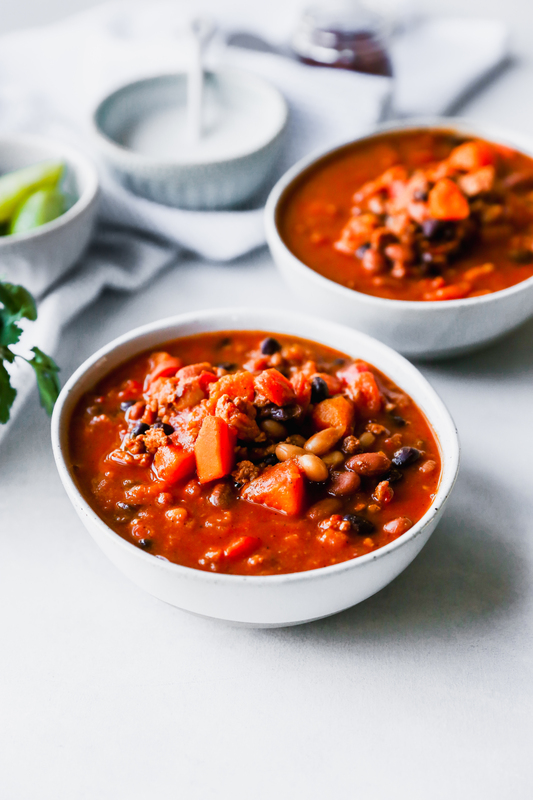 I mean, chili is pretty much the best thing ever this time of year ANYWAY…but when the mental and physical toll of winter manifests in a tortuous, snow-laden ride home, it’s even more appropriate. I had made a pot of this the weekend before the storm, so we were all set. 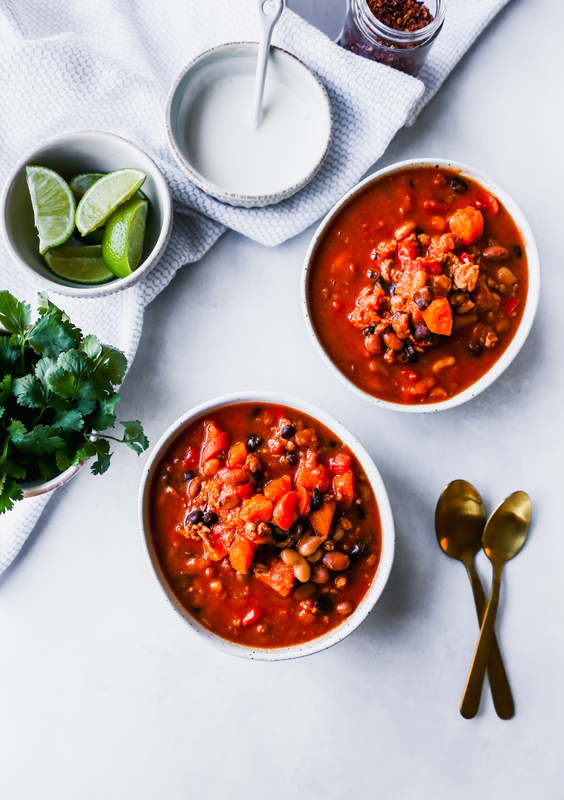 Not only is this chili healthy, but it’s oh so heartyand packed with flavor. I could eat it for days…which is exactly what we’ve been doing. 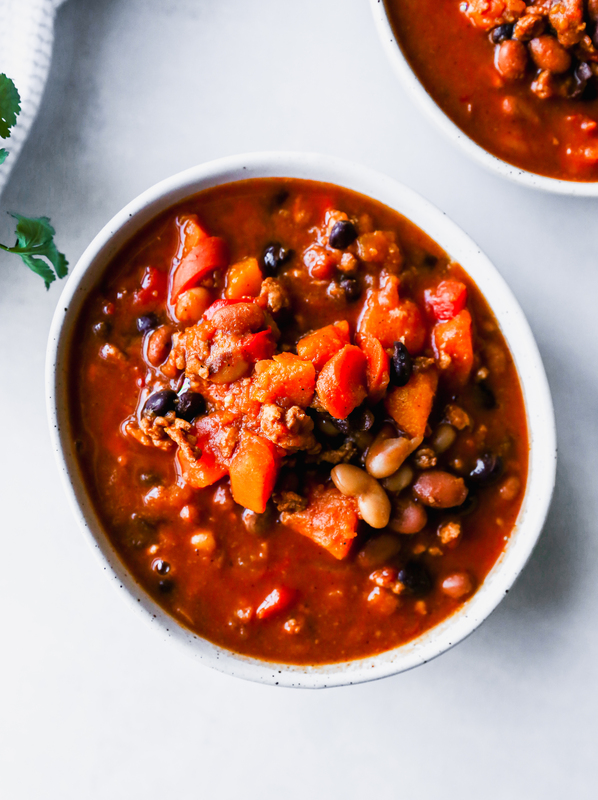 I make chili pretty frequently in the winter, and this recipe is up there with my favorite versions. 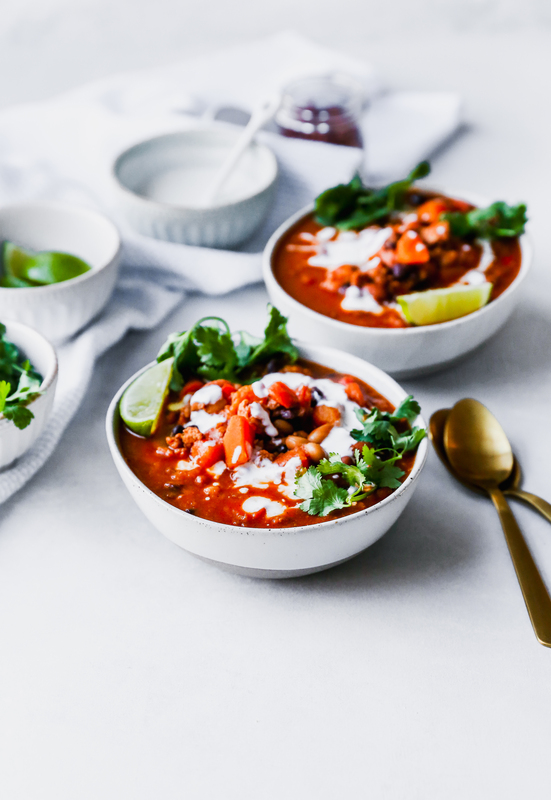 The chicken and beans keep things light, and the sweetness of the squash is perfect with all the spiciness going on. YUM. 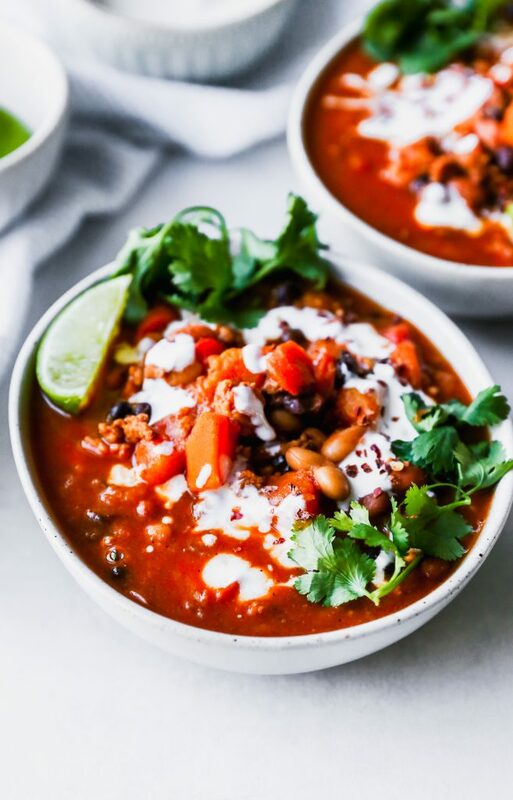 Plus, if you ever get sick of eating bowls of chili, you can repurpose the stuff in a ton of ways. Make nachos or chili cheese fries. Use it as a hearty pasta topper. It also freezes like a champ. 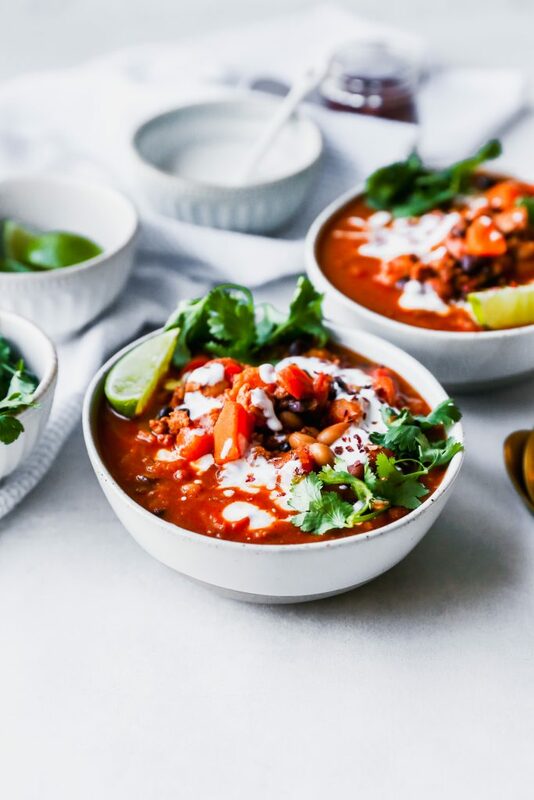 Chili is one of the best winter meals. Period. I normally love snow. It’s so pretty! When I woke up on my day off, I looked out the window and felt angry. I was angry at that damned snow! That’s how deep that commute scarred me. I felt myself scowling out the window, thinking “bah-humbug” thoughts, and tensing up at the thought of going outside. So I didn’t. I stayed in, curled up with bowls upon bowls of chili. Today, I woke up and wasn’t quite as mad at the snow. Maybe the chili had something to do with that? I like to think so. Heat oil in a large dutch oven or pot over medium heat. Add the ground meat and sprinkle in the spices. Brown the meat, breaking it up as it cooks. Once cooked, remove from pan with a slotted spoon and reserve. To the drippings left in the pan, add the onion, carrots, celery, and bell pepper and cook for 10 minutes or until soft. Add the garlic and cook for another minute. Add the jarred peppers, diced tomatoes, beans, reserved chicken meat, and chicken stock. Bring to a simmer, reduce heat to low, and cook for 60-90 minutes. You want the mixture to thicken slightly and the flavors to really develop. Chili, in my opinion, tastes best after it has cooked for a couple hours. After an hour or so, add the squash. Allow to simmer for another 30 minutes or until the squash is tender but not falling apart. Check for seasonings. Serve with desired toppings. 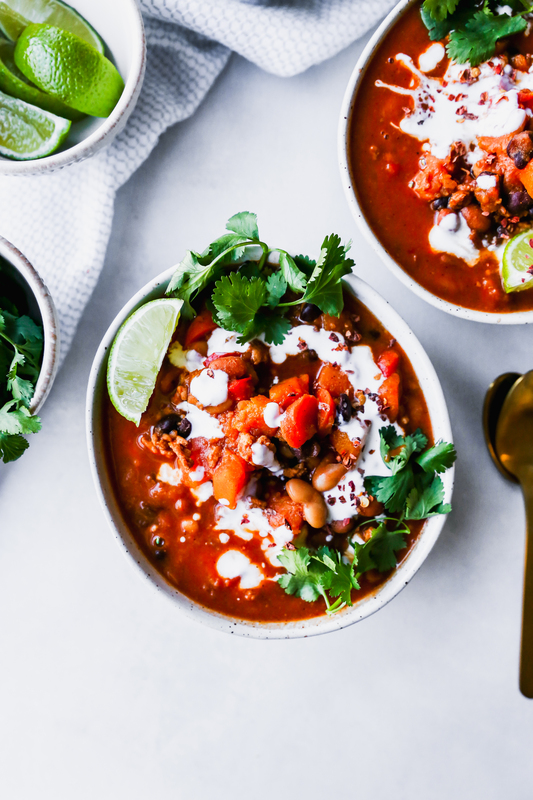 A vegetarian version of this chili would be just as good. Simply omit the chicken and swap in vegetable broth for the chicken broth. It will still be plenty hearty with the beans and squash. Also, feel free to sub in or swap out any of the vegetables or beans here. For instance, if you don't have all three kinds of beans on hand, feel free to use all pinto beans.